Although the tuna gets packed in salt for two days, then sun-dried for 20 more, it maintains a fishy flavor. With a lingering saltiness, a firm texture, and hints of umami, the thinly sliced strips make an ideal tapa to be enjoyed in Madrid at lunchtime with a small beer. They’re commonly served on tiny pieces of bread with olive oil. 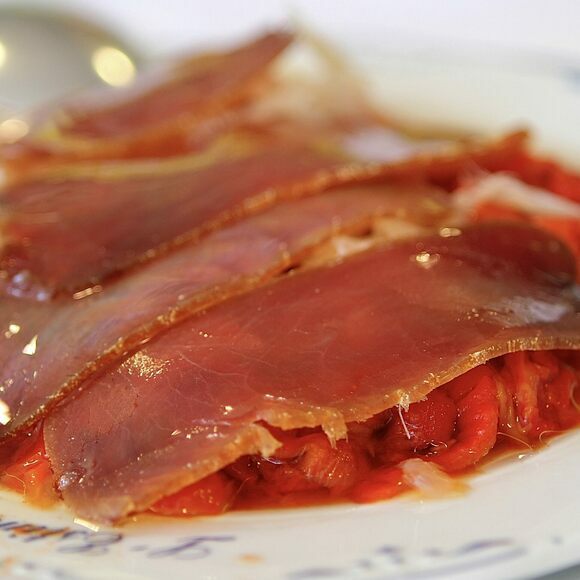 Chefs often pair mojama with chopped tomatoes or, particularly in Valencia, with almonds. Sometimes they might grate the dried, reddish fish over other dishes, such as pasta, salads, or scrambled eggs. Since mojama has an intense flavor, many fans recommend pairing it with simpler meals. It is quite expensive to buy a complete block of dried mojama; it’s more affordable to order it as a tapa in a bar or to buy a small pack, presliced, from the supermarket. Mojama is available at markets that specialize in Spanish fare or online from La Chanca and Herpac, retailers both based in Barbate, the "tuna capital" of Spain. If you're eating from a vacuum-sealed package, let the mojama air out for at least 15 minutes before eating. Chef Julio Vázquez blends mojama from Barbate with foie gras. Chef Miguel Angel Rubiales makes a salad with mojama and spicy pineapple. One of Barbate's most famous mojama producers sells its wares and leads tours where you can see workers making the famed tuna product. Tours are in Spanish. This restaurant specializes in Andalusian fare, including mojama.